The generosity of the community never ceases to amaze members of the Houlton Rotary Club. HOULTON, Maine — The generosity of the community never ceases to amaze members of the Houlton Rotary Club. 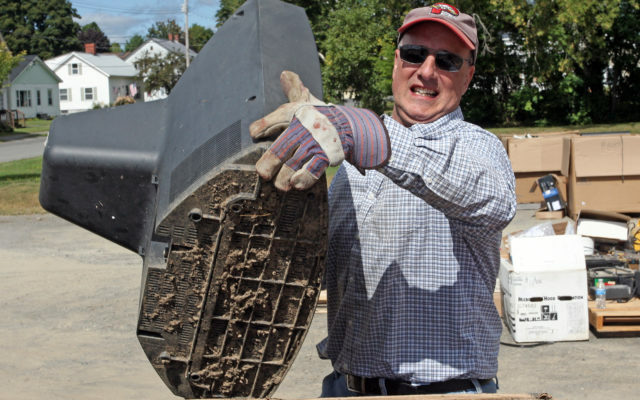 On Saturday, Rotarians were collecting old electronic devices as part of the club’s third annual “E-Waste Recycling Day,” when one of the early patrons swung back around after unloading his vehicle. The organization declined to say how much they received in donations, but said the funds would go toward Houlton Rotary Club and Aid For Kids projects. “We officially opened at 9 a.m., but we took our first carload at 7:30 a.m.,” Rotarian Mac Randolph said. Randolph added that he continually is amazed by how many items get turned in at the event. Three full 48-foot tractor trailer loads were hauled off by Electronics End, LLC out of Brewer. Last year’s event collected more than 74,000 pounds of electronics and Randolph said he was hopeful they would beat that figure this year. 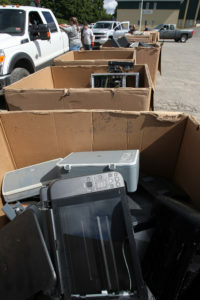 Among the items collected were televisions, computers, copiers, fax machines, cell phones, microwaves, game consoles, CD players, DVD players, medical electronics, industrial electronics, lead acid batteries, mercury thermostats and portable electronic devices. He added that when people toss televisions on the side of the road or use them for target practice in their backyard, all of the harmful components get into the ground and can contaminate drinking water supplies. Every ounce of copper that can be recycled from items is one less ounce of copper that needs to be mined from the ground, Randolph added.